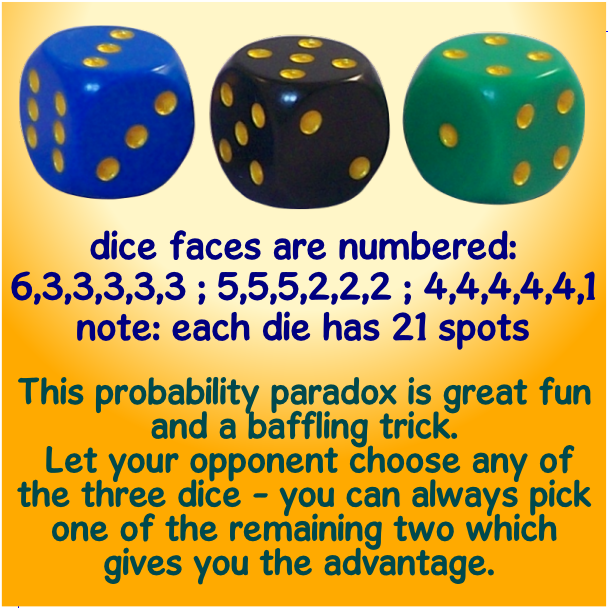 These dice have the peculiar property that no matter which of the four is chosen, at least one of the remaining three has a strong statistical advantage over it. 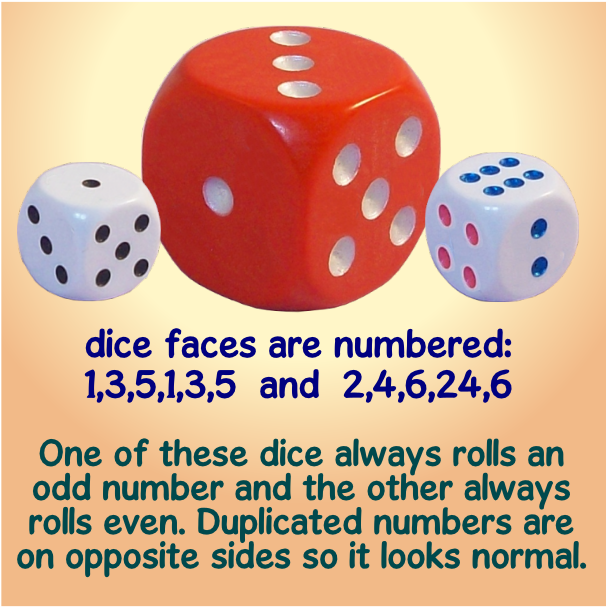 Invite your victim to examine the dice and point out that the numbering is non-standard, one even has blank faces, and that in fact the total number of spots on each dice varies. 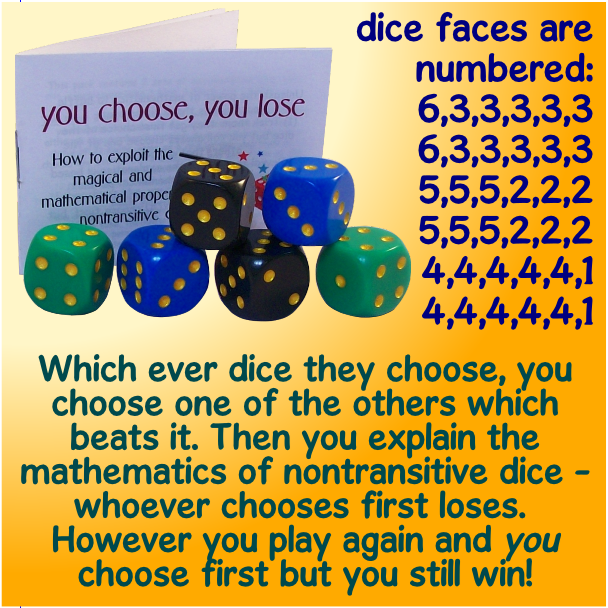 Ask them to choose any one of the four dice (they’ll probably choose the one with the most spots, but it doesn’t matter), then you select one of the remaining three. 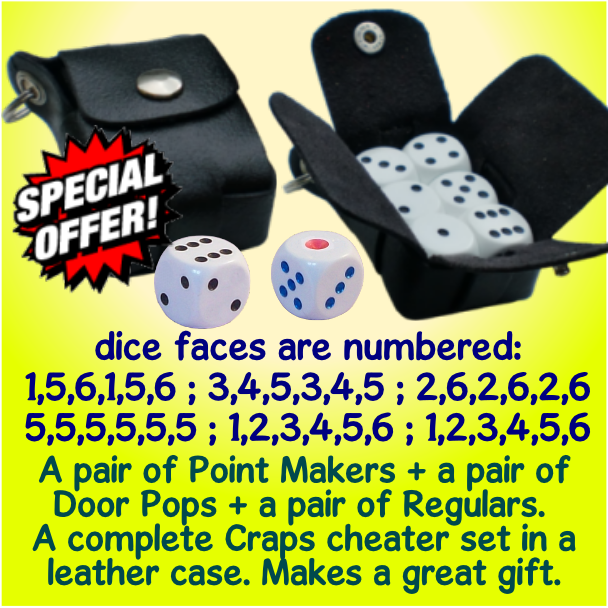 You both throw your dice at the same time and the highest number wins. 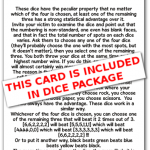 If you do this, say ten times, you will almost certainly win more often than your opponent. 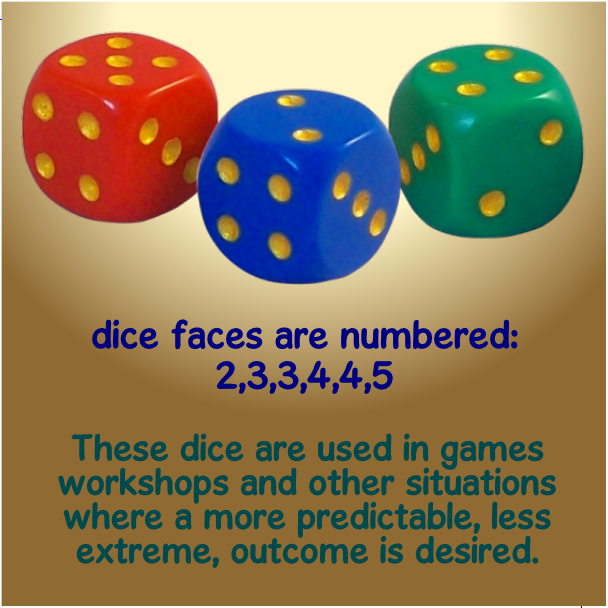 The reason is that these dice are what mathematicians call “non transitive dice.” They illustrate a probability paradox, or in other words they defy common sense! 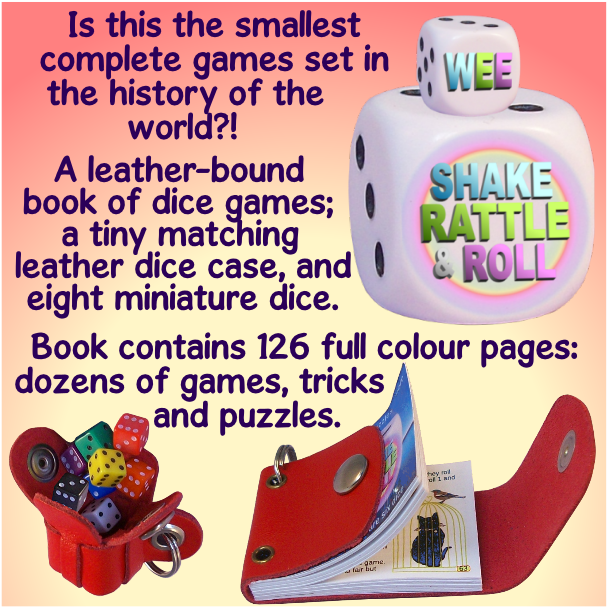 Imagine a game of scissors-paper-rock where your opponent chooses first. If they choose rock, you choose paper, if they choose paper, you choose scissors. You would always have the advantage. 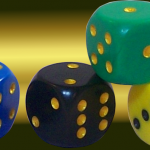 These dice work in a similar way. 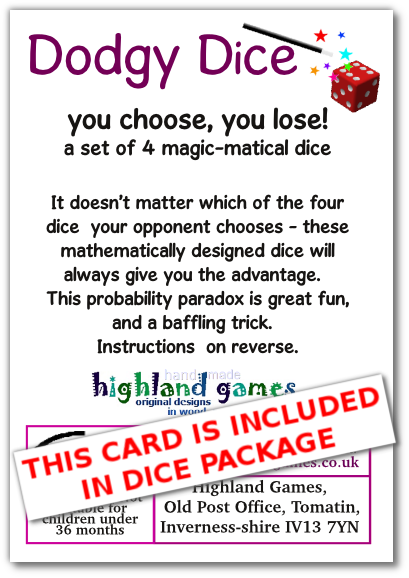 Whichever of the four dice is chosen, you can choose one of the remaining three that will beat it 2 times out of 3. 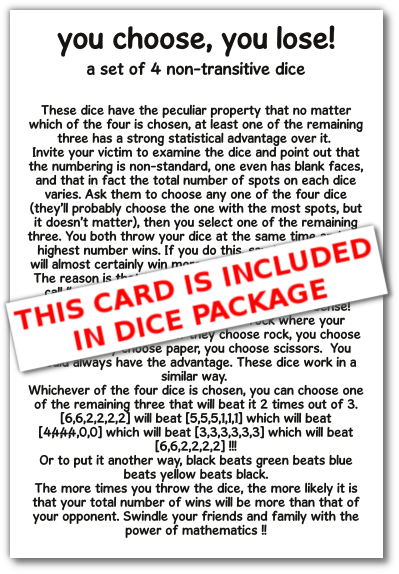 [6,6,2,2,2,2] will beat [5,5,5,1,1,1] which will beat [4,4,4,4,0,0] which will beat [3,3,3,3,3,3] which will beat [6,6,2,2,2,2] !!! 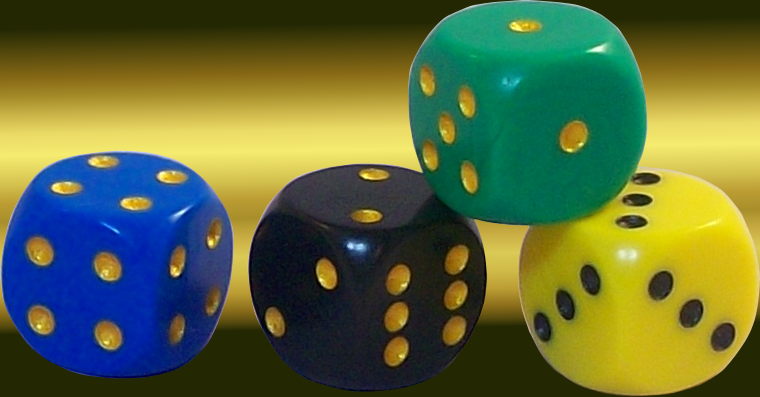 Or to put it another way, black beats green beats blue beats yellow beats black. 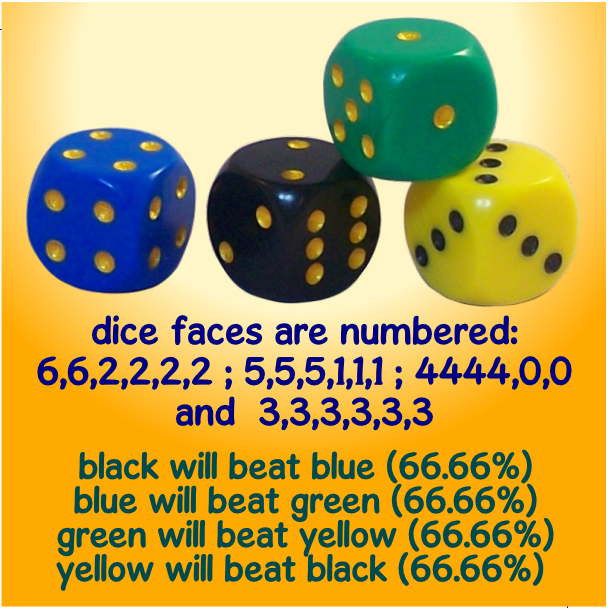 The more times you throw the dice, the more likely it is that your total number of wins will be more than that of your opponent. 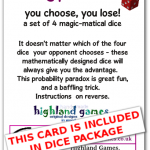 Swindle your friends and family with the power of mathematics ! !